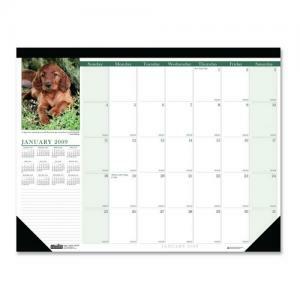 Block Size: Large - 2.50" x 2.75"
Monthly desk pad offers a color picture of puppies and a fun quotation on every page. The one-page-per-day format features unruled daily blocks (2-1/4" x 2-7/8"), shaded weekends, Julian dates, days remaining, ruled space for notes on the left, and a full-year calendar reference above the notes area. Planning pages range 12 months from January to December. Desk pad also includes black reinforced leatherette corners and binding. Pad is made of 100 percent post-consumer fiber.